Following the success of the first series, Pauline Quirke returns in her role as MJ – Head of the police’s Missing Persons Unit for a further 10 episodes of the critically acclaimed programme. It is a year on from the first series and MJ is still struggling to live with her sister, who was found in the first series but that’s the least of her troubles as soon her estranged father shows up. Has he really changed or is there more family trouble on the horizon? Things are not easy at the office either, as Amy and Jason’s affair comes to an end when one of them sets their sights on promotion. Returning for the second series is Pauline Quirke (Broadchurch, Birds of a Feather), Felix Scott (Inception, Blitz Blitz), Pooja Shah (EastEnders, Bend It Like Beckham), Mark Wingett (The Bill, Snow White and the Huntsman) and Adjoa Andoh (Invictus, Casualty). There are also guest appearances from Brooke Kinsella (Eastenders, Kid in the Corner), Gary Lucy (The Bill, Hollyoaks) and Roy Hudd (Coronation Street, Purely Belter). 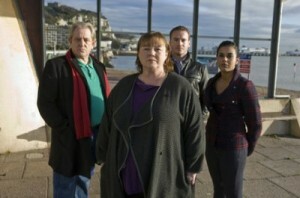 Missing was filmed on location in Dover including the Port, White Cliffs, and St Margaret’s Bay. They also visited Tonbridge and Tunbridge Wells. Dover is best known for the world famous White Cliffs of Dover along with the Port of Dover and Dover Castle. The Dover area has previously featured on screen in The Tunnel: Sabotage (2016), Wolf Hall (2003) and Sherlock Holmes: Game of Shadows (2011). Tonbridge is a West Kent market town with a rich cultural heritage and spectacular scenery. The area is surrounded beautiful countryside and boasts castles, stately homes, gardens, farms, as well as sports and leisure facilities. The Tonbridge area has been used by previous productions including Love Your Garden (2013) Piers Morgan’s Life Stories – Dame Kelly Holmes (2012) and Countryfile (2009). The new series starts on BBC1 from Monday 15th March at 2.15pm. This entry was posted in Filmed in Kent and tagged Dover, Felix Scott, Missing film locations, Pauline Quirke, Port of Dover, St Margaret’s Bay, Tonbridge, TV Drama, White Cliffs of Dover. Bookmark the permalink. ← We’ve come on holiday by mistake!